Home Middle East Turkey Marmaris Where to spend your beach holiday in Turkey? Where to spend your beach holiday in Turkey? A holiday every now and again can be nice. If you work hard all year, you want to take a break from it all. You want to take your family and just go away to the sun. A beach holiday in Turkey is the perfect fit for you. Gentle people, good food and gorgeous weather. Turkey has it all! But Turkey is huge and the options are overwhelming. So how to decide where to spend your vacation in Turkey? Read my guide to find out the best places in Turkey for your summer vacation. But the country is also hugantic. It even is part of Europe and Asia. So where to go? Where is the best place to spend your beach holiday in Turkey with your family? It must be a nice place, with good infrastructure, good food and no worries. So where should you go? Luckily for you: I’ve been to all of the places. Well, ok, maybe I’m exaggerating a little bit for effect, but I’ve been to Turkey many many times. I’ve been to all the biggest places along the coast and explored a big part of the country. Check this Turkey Visa Guide from Amaryroad for more details. I’ll take you along with me, as we travel along the coast and I’ll highlight each feature of the area. This way, you can decide for yourself what’s the best place to spend your beach holiday in Turkey. And in the end, I’ll even give you a little secret insider tip… Curious? Read on. The beach resort town of Kusadasi (Kuşadası) is situated right at the Aegean Sea. It’s part of the province of Aydin and 95 km (59 mi) away from the big city Izmir. The name Kusadasi means Bird Island. Some key points about Kusadasi. There are not that many other bigger towns besides Kusadasi, because the beach resorts are stretched along the coast line of the bay of Kusadasi. I found Kusadasi quite windy. In summer, there is always a nice breeze. But when autumn kicks in, it can get rather chilly in the afternoon and winters are colder and wet. The beaches are sandy and long. The water needs to warm up a bit during spring. But when summer is full on, it’s a great place to spend your beach holiday in Turkey with your (little) children. There are some huge beach resorts in Kusadasi but overall there are many smaller hotels and resorts. The further away from the centre of town, the larger the resorts get. Transportation is well arranged so you can easily leave your resort and head to town. As the summer is not scorching hot as other destinations in Turkey, this gives you the opportunity to explore some of the surroundings of Kusadasi. Sit at the harbour and watch the giant cruise ships dock. 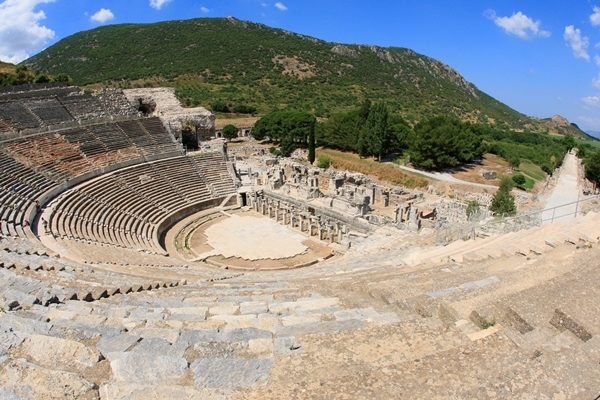 Top Unesco attraction, the ancient site of Ephesus is not far away. This ancient city from Roman time is worth a day’s visit. You can join a tour or go by yourself. Mountain hamlet Sirince is known for its wine production. Join a tour to get there. Read more on Sirince at turkishtravelblog.com. Bodrum city is the centre of the peninsula of Bodrum. It is part of the Mugla province and located at the southern Aegean Sea. Bodrum is located at the ancient sight of Halicarnassus, one of the 7 ancient wonders of the world. Although it might only take you 40 minutes to arrive at the centre of Bodrum, I wouldn’t recommend staying in Bodrum city. There are some great little villages dotted around the peninsula with private bays and crystal clear waters. The peninsula is quite rocky, so it’s not uncommon to have beaches of rocks, although here and there beaches have a small strip of sand. What I like about Bodrum is that many Turkish people like to go to Bodrum too. It is a favourite holiday destination of the Turkish people themselves. Bodrum centre. You can browse the market or just wander around town. Bodrum is famous for its floating nightclub, the Halikarnas. Greek Island Kos is only 1 hour away by ferry. Take one of the little dölmus busses from town and explore the inland of the Bodrum Peninsula. Head to Bitez for beaches, Turgutreis market or head to the clearest beaches of Yaliçiftlik. If we head further down the coastline of Turkey, we’ll reach Marmaris. It’s also part of the Mugla province. The town of Marmaris lies at the Mediterranean coast and continues on to the Turkish Riviera. Once a sleeping fishermen’s village, now a booming tourist destination. As we head further south, the temperatures rise and the winds calm down a bit. The whole bay of Marmaris is dotted with resorts and cities have sprung to blossom. When you go to Marmaris for your beach holiday in Turkey, changes are, you’ll be actually staying in the towns Içmeler or Turunç. Due to the calm seas in the bay, the place is a good destination for families with young children. If you have older children, they’ll have a good time in Marmaris too, because Marmaris has a booming nightlife too. Warmer in spring and autumn than Kusadasi and Bodrum, Marmaris makes for a good off-season beach destination in Turkey. The famous carved tombs of Dalyan are not far away. The whole Dalyan delta is a natural phenomenon with a unique ecosystem where both fresh water fish and sea fish can survive. 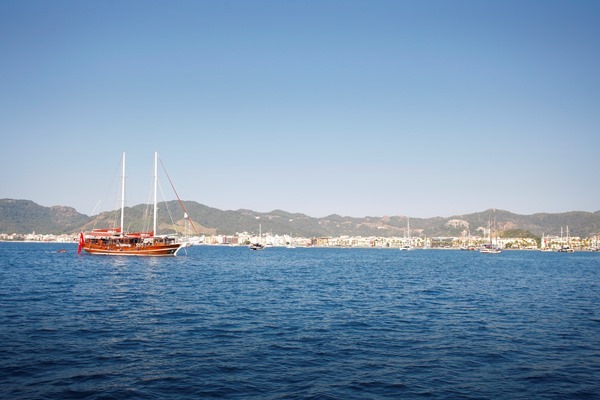 Taking a boat trip from Marmaris is an excellent choice. There is plenty to see and you can explore the little bays along the peninsula. If you’ve brought your sea legs with you for your beach holiday in Turkey, you can go on a week’s Blue Cruise. That way you sail the waters of the sea via traditional Gület boat. Datça is an interesting place to visit. 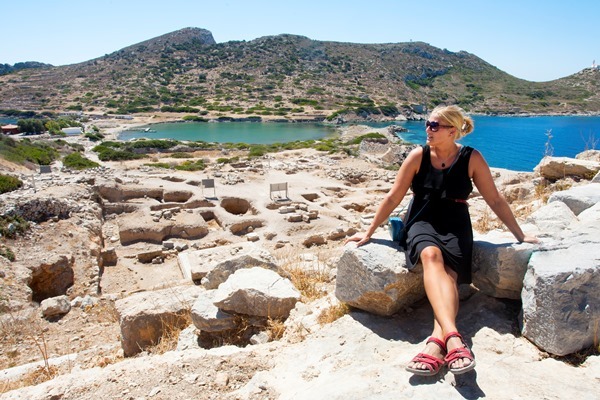 This ancient Roman excavation site is situated right at the tip of the peninsula, giving you 180 degrees stunning views of the Aegean Sea and the Mediterranean Sea. The Greek Island of Rhodes is only 1 hour by ferry away. Although the average maximum temperature in summer is not higher than that of the other destinations in Turkey, temperatures can spike to a whopping 42 degrees in August. Year round it’s a great destination, but I advise to avoid it during July and August. During these months the heat is very intense and I suggest avoiding it when you travel with very young children. 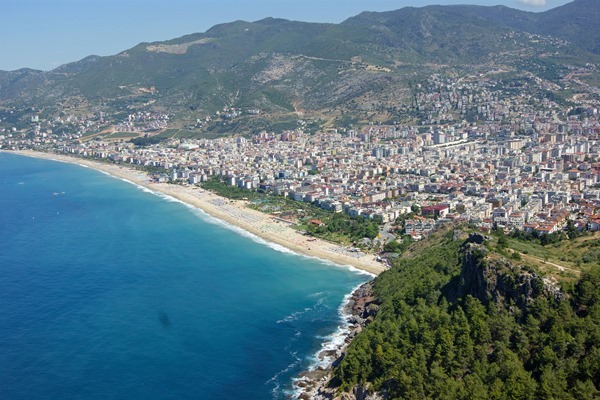 Although the town of Alanya is big, there are many other famous destinations for your beach holiday in Turkey. Cities like Kemer, Belek and Side are booming with hotels and resorts. 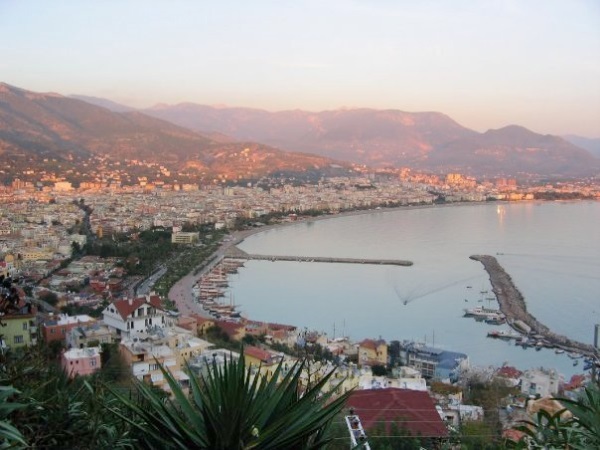 Climb the castle at the tip of the Alanya Peninsula. 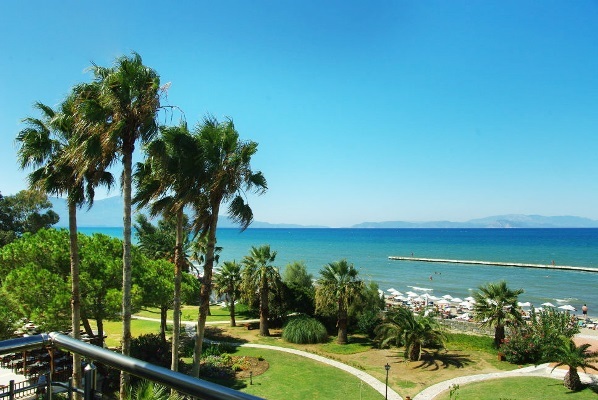 Here you’ll get stunning views across Cleopatra Beach and Damlataş Beach. If you like to get away from the city, consider going to the town Side. The ancient remains of the Temple of Apollo are a must see for any archaeology buffs. Can’t get enough of the ancient history? Go to Aspendos, the ancient city from 1000 BC. You can explore the restored theatre. Antalya is a shopper’s paradise. The market prickles your taste buds in every sense of the word. Along the roads from Antalya, there also many designer outlets and leather factories and gold shops. Go spend those Liras! Read more about things to do in Alyana. So there you are. I’ve given you the biggest destinations for you to spend your beach holiday in Turkey. You now know where to go if you want the shortest transfer time from the airport. Or which place is best if you’re travelling with small children. I’ve been to Bodrum at least 7 times and 2 times to Kusadasi, 2 times to Marmaris and 2 times to Alanya. It was however, my 14th beach holiday in Turkey which surprised me. I promised you, my insider tip. My beach holiday along the coast of Çesme was my biggest surprise yet. I think I can call myself a seasoned Turkey traveller. I’ve not only travelled to beach destinations, but also to other important destinations like Istanbul, Ankara, Konya and Cappadocia. Çesme was a spur of the moment decision because I wanted to go someplace new. Çesme is located at the western most tip of Turkey, 85 km (53 miles) west of Izmir, which makes the drive along the peninsula amazing. Nothing but calm sea and blue ocean as far as you can see. There are many resorts and hotels situated at the peninsula, but Çesme gave me a feel of undiscovered Turkey. The waters were pristine and the air was really clear and fresh. And psstt.. the word is out. The little town of Alaçati is one of the most genuine hidden places I came across in Turkey. It is features on 20 Incredibly Gorgeous and Underrated Travel Destinations, by the Sunday Chapter. Alaçati is a true bustling Turkish town and we had very much fun wandering around the streets at night. The place was packed to the brim with Turkish people having a night out. It felt like a genuine Turkish town. Now, if you’re considering going on a beach holiday in Turkey for the first time, consider Çesme. You’ll have a unique experience, nothing like the other bigger beloved beach destinations. The waters are clean, the air is calm and the people are friendly by nature, not for making a buck or two. We now have come to the end of our journey together. We travelled along the west coast of Turkey. We discussed Kusadasi and Bodrum at the Aegean Sea and travelled further south to Marmaris and Alanya. Whichever destination you choose for a beach holiday in Turkey will be great. The weather is great in summer, there is plenty to see and do and you can easily move around. If you feel for something different than those top 4 beach destinations, consider Çesme. It’s my special insider tip and I hope you like it. Have you gone for a beach holiday in Turkey? Where did you go? Which is your favourite place? Please share in the comment section below! I’d love to hear from you. Owh that would be a great spot to live for a while Karin! I might visit you then. Turkish coast is quite the thing! We’ve visited Bodrum and also Butterfly Valley (all details in the blog) on the Mediterranean side and we’ve loved the ones on the Black Sea too! Thanks for sharing! I love everywhere in Turkey with the nice water Sara. Every beach and little inlet looks so gorgeous. Wow, so much to do so little time! So much great information! And your photos are gorgeous! Beautiful photos! Thanks for providing so many details on the beaches in Turkey, great planning information! Thank you Jen. I hope it was helpful for the time you want to go to Turkey.